Wait. Now how is that supposed to compared with the fact that Standard Chartered almost certainly conspired to evade U. S. sanctions? * Why are they mad at Benjamin Lawsky instead of at Standard Chartered? And when you think a violation of inter-regulator “protocol” is worse than a systematic plan to defraud the U. S. government and break sanctions against Iran, of all countries—it’s hard to imagine how you could be more captured, without knowing it. As for the point that the sudden announcement could have threatened the stability of Standard Chartered: First, how does that compare to breaking the law in the first place? Second, if you’re worried about systemic risk, there’s a simple solution. If Standard Chartered’s equity goes to zero, the government should just buy it up and take control of the bank or, alternatively, buy new equity on favorable terms. That would put to rest any systemic concerns. And if, as the U. K. regulators claim, the bank is sound (and it should be, with that booming business in evading U. S. sanctions), then the market value will go up when the brouhaha subsides, and taxpayers will earn a profit. * See, for example, paragraphs 30–32 of the complaint, quoting from an internal manual giving instructions on how to manually override data fields to hide Iranian clients. This entry was posted in Commentary and tagged banks, regulatory capture, Standard Chartered. Bookmark the permalink. So the problem isn’t that “people” weren’t warned, it’s that they simply did not believe any regulator in his right mind might take his findings public.. The problem I have with the Standard Charter situation is that earlier this week it was announced that the bank agreed to a “settlement” with the NYS regulators regarding their violations of NYS and US law. The bottom line is – if you want to break the law and not have to worry about doing jail time, become a banker. Excuse me, but these were criminal acts, even more so than the previous frauds pulled off by the banking community. But the regulators that allegedly represent us allow these criminals to pay a “settlement” which is likely a small fraction of the money they made from the illegal activities. Only when these criminals are put in jail will there be a chance that behavior in the industry starts to change. Or are we going to change the justice system to allow the rest of society to buy their way out of prosecution and jail time? It appears Treasury was more concerned with the sanctions violation relating to the Iranians, than its’ usual blind eye in evaluating criminal bank conduct relating to fraud, collusion, theft, and misappropriation. OFAC swings a mighty cudgel in the department, it appears. 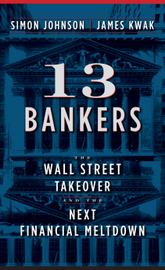 John Golde: May I recommend Bill Black’s book about the S&L crisis, The Best Way to Rob a Bank is to Own one? is bad logic. In no way does involvement in avoiding US sanctions guarantee the success or health of the bank as a whole… in fact, one could argue that banks in precarious financial positions and in desperately in need of new revenue sources are more likely to take risks like this. It looks like several other banks used to do business like this in Iran, but ceased that activity after the 2008 rule change. It’s possible Standard would have stopped as well if they were in a position to forego the profits involved. Although it’s more likely that greed and an attitude of being above the law were behind their actions, just thought this was worth pointing out, that dynamic is worth keeping in mind in other cases. Also, I think if they were being totally honest the FSA would admit that when it talks about long standing protocol, it is really making a veiled threat that in the future, if US regulators like the NY org can unilaterally go after British banks like this without “playing nice”, then it might start doing so as well…. No one likes to miss an opportunity for a big fat opportunity for an insider trade. its sad but i am losing hope and faith in the system. What industry other than finance has ever been allowed to cause the depth and scale of destruction we’ve seen over the past few decades and not only to survive, but to maintain its power, influence, and – to a large extent – its profitability? When civilizations fail to defend themselves from the least trustworthy among their elites, corruption becomes the norm and ordinary notions of decency are transformed into the quaint vagaries of powerless rubes. We’ve seen this sequence recur throughout recorded history, yet have apparently learned nothing save new ways to ignore the obvious: This will not end well. They’ve (London regulators) “dropped the ball”. A poor way actually of wording it, “dropped the ball” implies absent-mindedness or lack of awareness. We can see from the regulators who are not doing their job and expecting Benjamin Lawsky to cover their dirty a$$, that this is intentional corruption, not “cultural capture” as some of our more extremely naive opinion leaders might phrase it. The obvious message from London regulators here to Mr. Lawsky, a man who actually takes pride in his work, and figures he was hired to do something other than show up on payday is “Mr Lawsky, if you do our job, the public becomes aware we are NOT doing our job, join the finger-up-my-a$$ bandwagon, and look the other way”. How come Reuters in Feb nor NYT today reported DOJ never put together a coordinated team, led by either NYC or Chicago, to prosecute MFG? Why hasn't auditor PwC been called by Congress to explain destruction of shareholder wealth: Barclays, MF Global, Chesapeake, and JP Morgan? As we’re sure to hear British regulators and their defenders make cute British humor on BBC that “Americans have enough problems of their own”. Yes, guilty as charged. But since when do two wrongs make a right?? This action apparently threatened the handclap response preferred by bribed – I mean purchased regulators. How dare anyone upset the status quo allowing criminals and criminal oligarchs get away with wanton and systemic criminality. Such action might actually benefit the 99% – and we all know – we can’t have that when socalled governments and socalled regulators are pathologically focused on propping up, shielding, protecting, and advancing the den of vipers and thieves in the predatorclass finance oligarchs. This entire post is rhetorical and an academic attempt at satirical comedy – right??? James Kwak — Finally, AT LAST, you are asking some god-damned good questions. Once again Tony you echo my feelings exactly.. Thieves being thieves, what a surprise! The sooner the masses pull the wool from their eyes the sooner humanity might prosper. Banks are the plague of our times. Its just not that the government and regulators are captured – now its the judiciary also. Right! Would you ever think that Hollywood after such an absolute failure at the box-offices of a Basel II would allow the same people, using the same script to produce an even more expensive Basel III? The problem with people and wars is they always show their cards before the hand is actually played. Any warlord is going to support anything to rid his or herself of the enemy. What is not relized is the double edge sword effect of their beliefs. And they are never satisfied until their team controls the whole theater. It’s what I call their river of denile, cause that’s where the whole bunch of them end up as the curtain falls on their dreams. Then they do become desperately shaken, as the consequences are paid by a hardening of the hearts. If the bank is going to fail, let it. This would be a great opportunity to set an example. Here is a single paragraph from the August 24-31, 2012 issue of The Week magazine. Let’s review briefly what happened here. A Goldman customer, John Paulson, came to Goldman and asked the bank to assemble a number of portfolios of mortgages that were sure to fail. And that is what Goldman did. But here is the good part! Paulson then sold the packages of mortgages SHORT since he knew they would fail to be repaid. Hang On, It Gets Better!! At the same time Paulson was selling the packages short, Goldman was selling them to other customers of the bank as LONG bets. Kerisssstt……………..How crooked can you get???? What do you suppose would happen in Las Vegas if a poker player (Paulson) got caught with a marked deck? What do you suppose would happen in Las Vegas if the dealer (Goldman Sachs) got caught with a marked deck? Now suppose you are in Las Vegas playing poker with the house dealer and one other player, and both of them have marked decks. Does the word SCREWED come to mind? There is an old saying amongst poker players. “Look around the table to spot the sucker in the game. If you can’t, it’s you”. And “the burden of proof” has been met???? Everybody in the world knows what happened. Books have been written about it. Michael Lewis’ “The Big Short” is the best. So look around the room wherever you are now, and know that you and everybody else in the room (and me) are the suckers. The Obama administration and especially the Europeans were tardy and unenthusiastic about Iran financial sanctions, hence failed to police them vigilantly. The NY State regulator was more serious. Perhaps the title should be “Obvious”, in reference to the capture of government? Removing convictions and jail time from the equation sends the message that moral behavior is not rewarded (you will stay out of jail either way) and makes the decision of whether or not to commit a crime a purely financial one. It’s live every day as if it were your last. A greater cacophony is difficult to imagine. And no need to believe in a God, since we can’t be caught in a lie or a crime, unless he can read your mind. The not in stereo version. The Federal Regulatory’s response that Lansky compromised their effort does not hold water when one considers the lack of action on Madoff, MF Global, Lehman 105 repos, Bear Stearns’s EPD mortgages, Goldman’s Abacus marketing, handing of foreclosed properties , MERS, hands off approach to swaps and derivatives, oversight of Fannie & Freddie and virtually every crisis, fiasco and legal transgression to have occurred. Today regulators are either captured, inept or more concerned with banking profits or monetary policy than a sound financial system and application of rule of law.